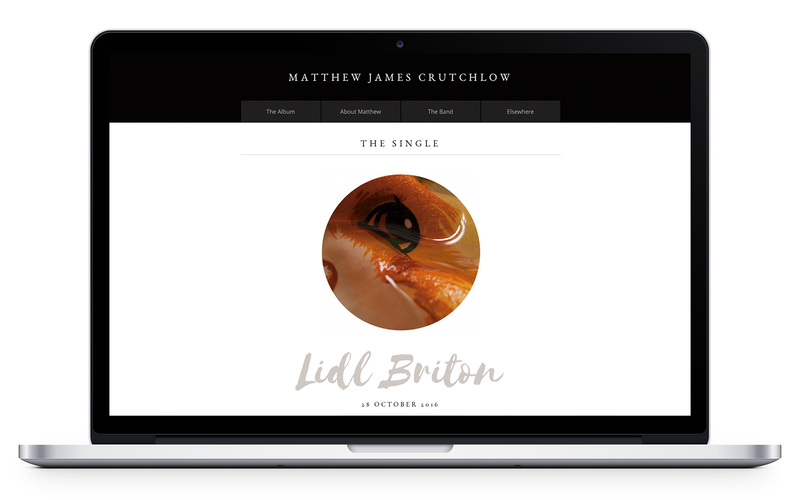 Independent singer-songwriter Matthew James Crutchlow asked us to design, develop and host a microsite to help him launch his debut solo recordings. After a couple of conversations with Matt to get a feel for what he was looking for, it quickly became clear that he was looking to us to take the lead on the site’s creative and technical direction. But with the launch dates for the single and the album already in the calendar, we were in a race against time. Taking styling cues from the pared-down album design, we decided to produce a single page microsite where visitors could use a simple navigation to scroll smoothly between sections. Matt was keen to showcase the amazing photography from his album’s artwork and also provide would-be listeners with some background information about each song. So we developed some subtle animation effects that prompted the visitor to jump from the album artwork to the relevant song details. We rounded the site off with information about the world-class musicians Matt worked with, and of course included prominent links to buy on iTunes and Bandcamp. Matt’s a damned good egg, so the job was a genuine pleasure to work on – it was a delight to be trusted by a fellow creative with such a personal project. And it goes without saying that we’re big fans of the record. See how we completely redesigned and rebuilt the SOFII Foundation web site.